Good news for TV and movie lovers. 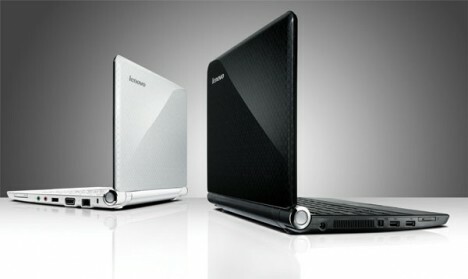 Lenovo has announced its new Lenovo IdeaPad S12, the first netbook equipped with NVIDIA’s Ion chipset. Lenovo IdeaPad S12 features with NVIDIA Ion platform for high-definition video and Blu-ray playback. It will allow users to watch TV shows or movies at 1080p HD resolution. IdeaPad S12 comes with an HDMI-out port to let users display high-definition video on a larger monitor. The Lenovo IdeaPad also includes a multitouch touchpad, a full-size keyboard, and a Lenovo QuickStart feature that launches users directly into a Linux shell for a few basic needs (Web browsing and Skype). The new Lenovo IdeaPad S12 is available in two versions. Th first version which comes with 1.6 GHz Intel Atom N270 netbook processor and Intel GMA 945 integrated graphics will ship in June. On the other hand, second version will arrive in August which combines an Atom N270 and Nvidia Ion integrated graphics. The new Lenovo IdeaPad S12 is available in two colors: Black and White. The netbook measures just 292 x 216 x 22-28.9 mm and weighs only 1.4kg (with 3-cell battery). Lenovo IdeaPad S12 will be available from July through leading retailers or via Lenovo website for a price of $449 with basic Intel specs, and it will cost $500 ($499.99) with NVIDIA’s options.